Kangaderoo Custom QR Code. : Crypto Currencies, what's n(e)xt? Quote from the movie How to Train Your Dragon: "Out with the old and in with the new"
After the success of Bitcoin during the last four years, especially during 2013 a lot of alternative crypto coin, or altcoins have been introduced. Most of these coins have a system that gradually generates new currency during it's lifetime. A process that can cause inflation during this generation phase. For the most common currencies this generation protocol is build upon a proof of work principle. This means that a lot of computing power is needed to generate a new block, and if in the system the amount of computing power increases, the difficulty is raised to keep an predetermined block update rate. A couple of months ago when the Bitcoin crossed the $1000 value, a mined block could generate a value of $50.000. This generation of money out of thin air seems to good to be true, and when something seems to good to be true is usually is. The cost of estimated power consumption of the worldwide computer network calculating these new Bitcoin blocks was valued higher then $50.000. This waist of energy does not fit the 'green' concept. So based on a different principle called proof of stake the latest Crypto currency created is the NXT Coin. Proof of stake has a nice short description on Wikipedia, that is better served with a link then a quote. In this system the Computers connected to this currency network do not have to compete to find the next valid block, so the total global computing power doesn't have to run full speed. This limits the energy required to keep the network up and running. 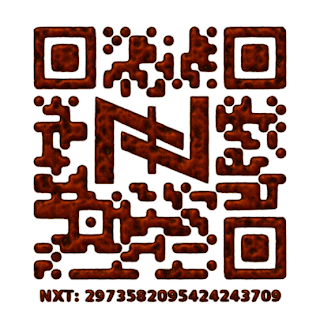 So what can be improved for NXT coin? Currently the source code is not open source, this requires a high level of trust in the developers. With all coins of this system already in circulation, generated at start-up this raises the question who had these early coins? And the proof of stake looks at the number and age of the coins to grant an online NXT-wallet owner to generate a new block and claim the transaction fees. The most filled and oldest wallets-owners will profit the most of this proof of stake principle. It is still a system with an increasing block-chain, that will grow in size over time, in my opinion not suited for mobile phones.